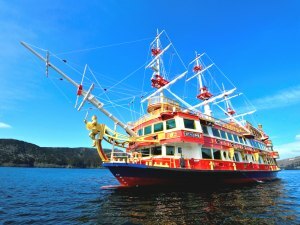 A regularly available sightseeing cruise ship that connects the Hokone Machi Port / Former Hakone Port and the Togendai Port of Hakone Lake Ashi (Ashinoko) (Kanagawa Prefecture, Hakone) in about 30-40 minutes (70 minutes round trip). Three cruise ships inspired by western sailing battleships are in operation and are known as the Hakone Pirate Ships. We operate a 10-40 minute regular sightseeing cruise that connects four ports: Hakone Sekisho-Ato Port of Lake Ashi (Hakone-machi, Kanagawa-ken), Moto-Hakone Port, Hakone-en Port and Kojiri Port. 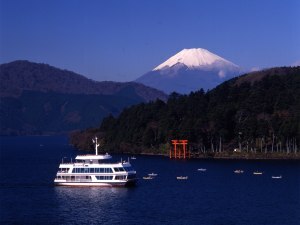 Another regular sightseeing cruise is also available which cruises from each port to Lake Ashi in about 30-70 minutes.